Cartographer. grid in 2 °. Usl. signs: borders: state, provinces. and obl., uyezd. and circles. ; roads: railways, highways with bridges, postal stations, transport, lanes, bunkers; telegraph and station; water: rivers and lakes; people. points on adm. division and quant. residents (9 gr. ), trade-prom. points; factories and plants. Coat of arms of Novgorod province. In the book: Russia. 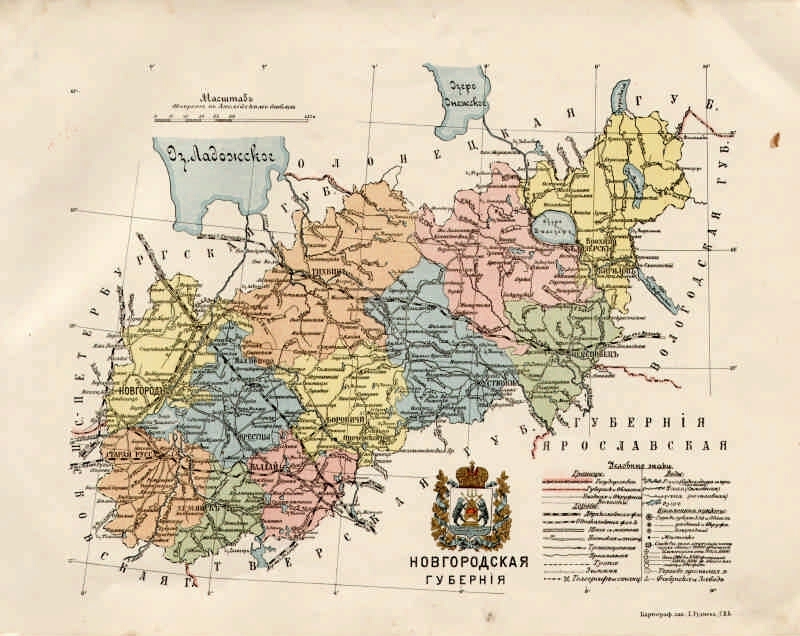 Geographical description of the Russian Empire in the provinces and regions with geographical maps / Ed. AE Ryabchenko. T. 1: European Russia, Part 4: Ozernaya oblast. [SPb. ]: Ed. on means Vel. book. Mikhail Alexandrovich, type. "Thrift," . Map No. 9 . 1. Territory of Russia (collection). 2. Novgorod region: pages of history (collection). 3. Novgorod Province - Geography - Maps. 4. Geographic maps.